One of the best parts of being a fan of Marvel today is the availability of Marvel merchandise and gifts. Among the merchandise that is most popular are some amazing superhero t-shirts. These t-shirts are a great way to show off your favorite superhero and look amazing at the same time. The design on this shirt is both fun and unique. The bold colors bring a little bit of Iron Man, Captain America, Wolverine and other Marvel-ous heroes to life! Deadpool has a unique sense of humor, doesn’t he? His funny side is all on display on this shirt. Besides…who ever wants to feel like an adult? Everyone has a little bit of the Hulk in them – especially at the gym! Thanks to this shirt, you can start allowing your inner Hulk out to play. Among the many Spider-Man gifts is this shirt that’s perfect for all Spidey fans. You can wear a little bit of Spider-Man’s costume every time you slip on this shirt. It’s well designed and looks very authentic to even the most trained eye. If T’Challa is your idol in this superhero-filled world, make sure you own this badass t-shirt. It’ll tell the world you’re obsessed with Black Panther and everything Wakanda! Do you love science and Marvel? This cleverly designed t-shirt gives you more of your superhero and villain favorites in one than nearly any other shirt out there in a periodic table format. One of the things everyone loves most about Deadpool is his attitude. This shirt gives whoever is wearing it a little bit of that attitude in a way that would make Deadpool proud. 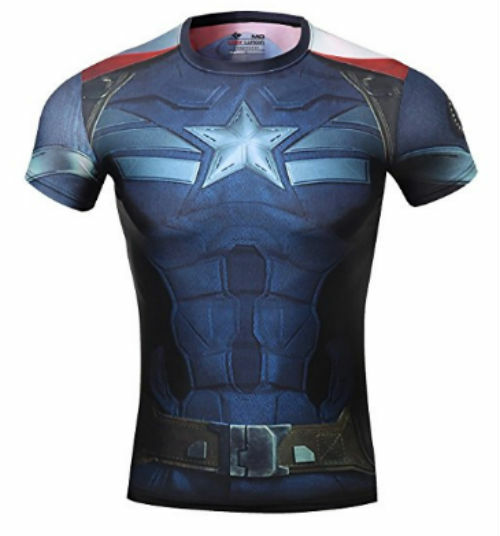 If you loved the Captain’s uniform in The Winter Soldier, this is perfect for you. Every time you wear this shirt, you will be wearing a piece of this iconic uniform. Nothing screams “I’m a Marvel fan” more than this t-shirt does! Featuring bright and bold images of all your favorite superheroes, this top was made for the oldest generation of Marvel fans. It will leave your friends guessing who you really support. If you see the legendary Stan Lee as your very own superhero, get your hands on this funny t-shirt that presents the Marvel creator in the most unique way possible! This top features the greatest heroes all in one to make it a one of a kind t-shirt. For those that have a serious obsession over Infinity War and its characters (even the menacing Thanos), this is the shirt for you. This shirt celebrates one of the most unique friendships in the Marvel universe. This combination of Spider-Man and Deadpool is every bit as unique as these two are. Want more from the Marvel universe? Check out our richest superhero list – you won’t believe who’s ranked as the richest MCU character! This is a shirt that is sure to attract all of the right kind of attention. The Avengers appear ready to spring into action in a flurry of bright and bold colors. If you had trouble choosing a side in Civil War, this shirt gives you the best of both sides. The simple colors make every detail stand out. This t-shirt is designed with stunning detail of Doctor Strange. The designs are crisp and clear while being simple enough for everyone to enjoy. 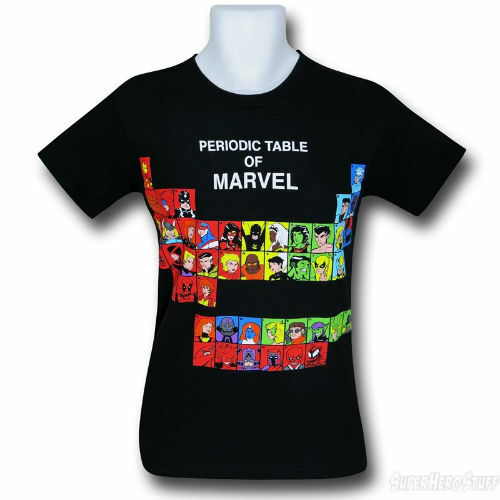 For the woman who is just as proud of being a Marvel fan as any of the men, this shirt is perfect for you. This is a simple design with just enough color to catch your attention. Groot is a character well-known for his limited speech. This shirt captures that funny side to him perfectly with its comical images. The Daredevil television show has a lot to offer. Now, so does this t-shirt featuring the blind superhero with bold colors that will make you stand out in a crowd. This simplistic yet ever-so perfect Avengers t-shirt features all the greats from Marvel’s latest hit blockbuster, Infinity War. From Black Panther to Groot, this top has no shortage of superpowers. This shirt has an amazing portrayal of the ballsy character, Deadpool. Brought to you in some of the most stunning graphics available on the market, loudly and proudly wear your favorite character on your shirt! 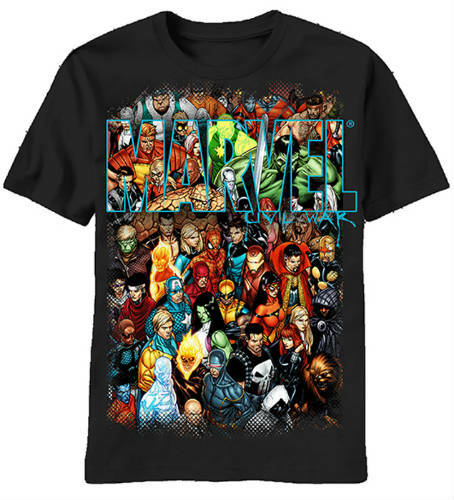 In need of some Marvel clothing? If you’re Team Thor then this shirt was designed with you in mind. Share your loyalty and express how worthy you are with this awesome shirt. This Ant-Man shirt is full of fun. With this top, you can carry Ant-Man around in your pocket wherever it is you are going. This Avengers t-shirt offers you all of the best of Civil War, showing your favorites ready to fight. A few of the main characters are on display but what it really comes down to is, what side are you on? Make America great again with Groot for President! Wear this shirt to show who you support for the position of President of the United States of America! Do you support Iron Man? Show your dedication to Marvel’s golden Avenger with this top featuring his signature mask. Suitable for any outfit, this item of clothing shows off your support for one of Marvel’s greatest heroes. There has never been a better time to be a girl that loves Marvel. The colors are bright and the message is clear -whether you’re channeling your inner Black Widow or Agent Carter, make sure to fight using all your girl power! This has to be one of the most iconic scenes in the MCU. Taken straight out of Guardians of the Galaxy 2, Yondu’s line honoring the one and only Mary Poppins should be worn by all fans. Ashley has a great deal of experience writing articles for blogs on many different topics. She has written about everything from entertainment to health care issues.